What's the best way to get fast and reliable results when weighing filters? Firstly, the environment is important. Ideally, your balance should be located on a dedicated weighing table in a room with a stable temperature and controlled humidity. 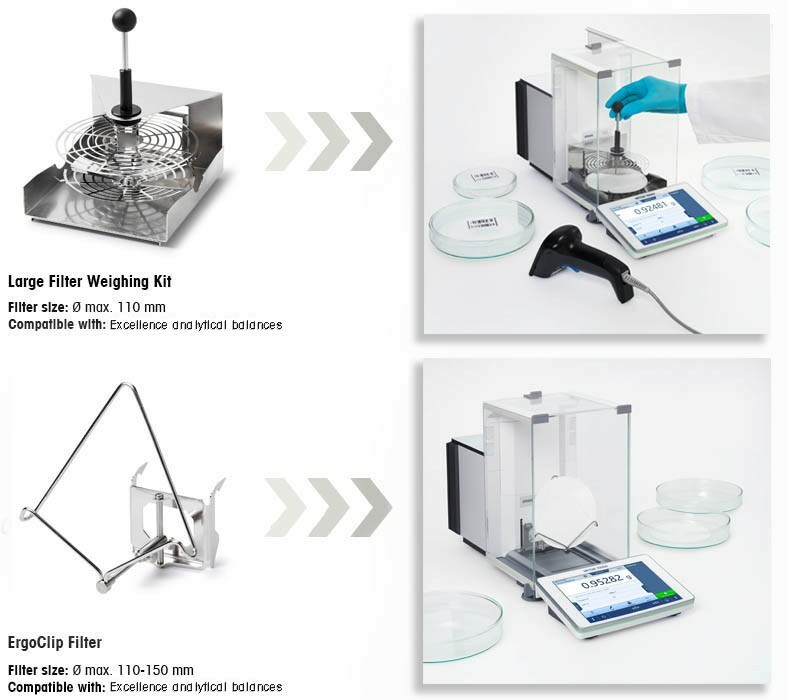 The filter weighing kits for METTLER TOLEDO microbalances and ultra-microbalances contain a special weighing pan which ensures filters are correctly placed on the balance. Correct filter handling with asymmetric tweezers will help ensure your filter weighing processes are fast and efficient. I'm using PTFE filters but my balance doesn't settle easily and the figures are drifting. Can you explain? PTFE filters are particularly prone to electrostatic charging. The unstable figures on your balance suggest that the weighing cell is being affected by electrostatic charges. The influence from electrostatic charges can significantly affect weighing results. Use an AntiStatic Kit before weighing each filter to remove any charges which may be present. I have to weigh different types and sizes of filters. METTLER TOLEDO offers filter weighing solutions for both microbalances and for analytical balances. There are two different filter weighing kits for microbalances, enabling you to weigh filters with diameter from 20 mm to 70 mm; it's easy to switch between the kits. 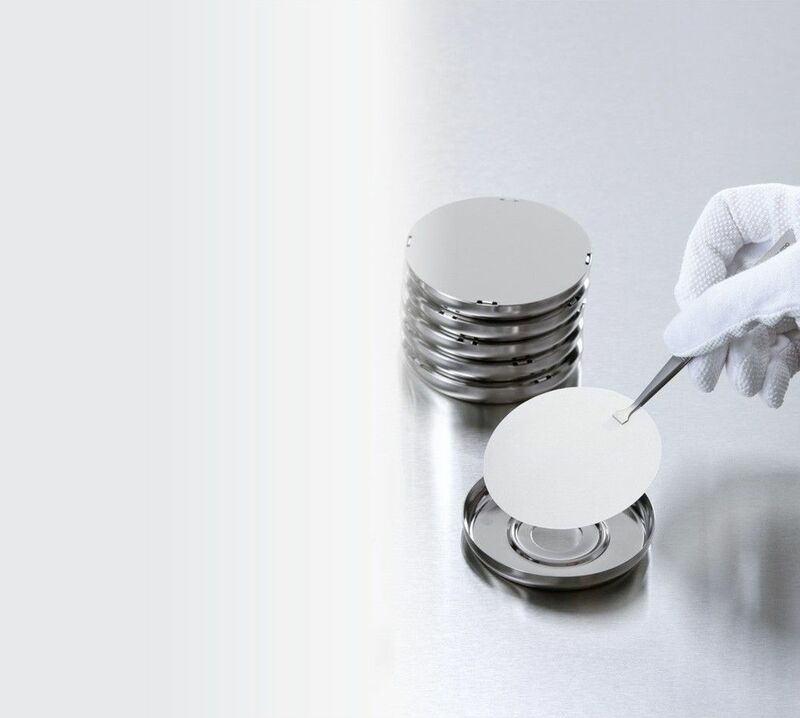 For weighing larger filters up to 150 mm in diameter on an analytical balance, there are two filter holder solutions available. The regulations we are following require that filters must be positioned centrally when weighed. How can I ensure this? The METTLER TOLEDO micro filter weighing kit includes two filter pans. Each has a unique contour which ensures the filter is automatically centered. Centering the filter eliminates eccentricity errors to ensure reproducible and reliable results. How can I be sure my filter weighing SOP is followed? A clear SOP should be in place for weighing filters in a regulated environment. However, in a manual process, human errors can occur, and in a process which requires many steps, it can be easy to make a mistake. LabX software enables you to create your own dedicated filter weighing SOP workflow. The step-by-step instructions for the SOP are provided on the balance display. Each step requires confirmation from the user so you can be sure the SOP has been followed. Which balance do I need to use to get accurate filter weighing results? Every measurement on ANY balance is subject to uncertainty. Understanding this uncertainty is the key to ensuring accurate weighing results. It is not the readability that determines the accuracy of a weighing instrument, but rather its repeatability. With the very small sample weights involved in filter weighing, the balance's minimum net sample weight capability is also of critical importance. To find the appropriate balance for your needs, you need to know the smallest amount you want to weigh and how accurately you need to weigh it (i.e. at what tolerance). METTLER TOLEDO's global weighing standard, GWP® helps you choose the right balance to meet your application requirements. Ask your local representative for a free balance recommendation. Determine if your existing balance meets your quality requirements. How can I improve productivity when weighing filters? METTLER TOLEDO filter weighing kits have glass lids so it's easy to see what you are doing when placing and removing filters. The microbalance draft shield doors can be set to open to the left or the right according to the needs of the operator so that filter handling is more ergonomic. To speed up the process further, the SmartSens infrared sensor can be used to open the doors with the wave of a hand. 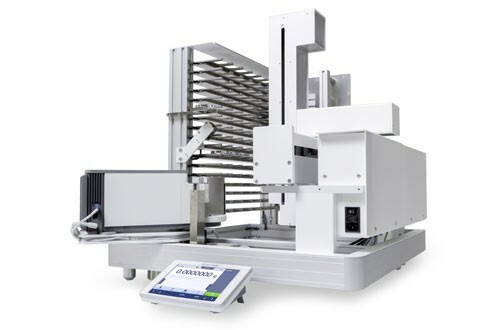 For high throughput filter weighing, we recommend an automated solution with the PFS-ONE filter weighing robot. My results have 5 or more decimal places. How can I avoid mistakes when writing the results down? Manual transcription of data and results carries an inherent risk of error. By connecting your balance to LabX software you can eliminate manual transcription and the associated risk of errors entirely. LabX also performs all your calculations, including air buoyancy corrections, removing a further source of potential errors. All data is saved securely in a centralized database so you benefit further from complete data integrity and traceability. How can avoid potential mix-ups of my filters? I need to ensure traceability too. It's vitally important to label the filter cartridges and ensure that results are logged correctly against each filter. When handling many filters, this can be a challenge. The process can be greatly simplified by connecting your balance to LabX, a barcode reader and a printer. LabX prints barcoded labels automatically. By using barcodes, the samples are uniquely identified. LabX uses the barcodes to automatically log the weight results against the correct sample. All data is saved securely in a centralized database providing full traceability. The PFS-ONE filter weighing robot can process up to 1,000 filters per day in a fully automated process with all data handled automatically. Emissions testing is an important procedure to measure and control air pollution from sources such as vehicles with combustion engines, power-plants, and other motorized equipment that produce exhaust and evaporative emissions. Particulate matter (PM), also known as particle pollution, is the general term used to describe solid particles and liquid droplets found in the air. Once inhaled, these particles can affect the heart and lungs, and cause serious health problems. Particle classes PM10 and PM2.5 (i.e. particles with diameter less than 10 µm and 2.5 µm respectively) are carefully monitored, both at emissions sources and in the air in general, due to potential health risks. Gravimetric analysis of PM collected via filtration is the most widely used technique for determining ambient concentrations of PM as well as the amount of PM in emissions. Weighing particulate matter on filters is a differential weighing application. As the amount of particulate matter collected is very small in terms of weight, the filters must be weighed very accurately, both before and after loading of the particulate matter. As a general rule, guidelines specify a balance with a resolution of 1 μg or 0.1 μg, with corresponding repeatability. Whether measuring particulate matter in exhaust gases, evaporative emissions, the atmosphere or ambient air, the gravimetric filter weighing emissions test follows the same procedure. 1. A blank filter is first weighed on a balance in the laboratory. 2. Filters are loaded into labelled filter cartridges, preconditioned and transported to the test site. 3. At the test site, the air or gases are drawn through the filter at a known flow rate for a specific duration. Any particulate matter (PM) present is retained on the filter. 4. In the laboratory, the loaded filters are conditioned again and re-weighed. 5. By subtracting the weight of the blank filter, the mass of PM can be determined (differential weighing). Concentration of PM is calculated using the flow rate of the gas/air sample. Whilst the test can be performed using just one filter, it is common practice to repeat the test several times as well as to retain a blank filter as a reference to eliminate background count. Filters may be used singly or in combination in a multiple-stage filter unit. The World Health Organization (WHO) considers clean air "to be a basic requirement of human health and well-being" and provides guidelines for selected pollutants which are applicable across all WHO regions. Emission standards set quantitative limits on the permissible amount of specific air pollutants that may be released from specific sources over specific timeframes. In the U.S., CFR 40 Part 50 is part of the United States Code of Federal Regulations and concerns national air quality standards. The Occupational Safety and Health Administration (OSHA), part of the United States Department of Labor, published regulations (Standards – 29 CFR) concerning air quality, and the National Institute for Occupational Safety and Health (NIOSH) is also concerned with promoting safety and health at work. The European Union sets legislation in the form of DIRECTIVE 2008/50/EC on ambient air quality and cleaner air for Europe; DIRECTIVE 2008/1/EC concerns integrated pollution prevention and control; and DIRECTIVE 89/654/EEC specifies the minimum health and safety requirements for the workplace. The automotive sector is a key source of a variety of air pollutants including carbon monoxide (CO), hydrocarbons (HC), nitrogen oxides (NOx), particulate matter (PM), as well as greenhouse gases (GHG). In both the European Union and in the United States, legislation exists to control emissions from motor vehicles and motor vehicle manufacturers are obligated to carry out emissions tests. There are many methods and guidelines for testing emissions and particulate matter concentration. One of them is the gravimetric filter weighing method. Guidelines and regulations define the procedures to ensure accurate, reproducible filtering of emissions, and specify which filters should be used and which weighing system to use for the measurement as shown in the table below. It is foreseen that, as a result of increasingly tighter regulations combined with technological advancements in combustion engines, the amount of PM collected on filters will gradually decline. With guidelines typically specifying a balance with a readability of 1 μg or 0.1 μg, a highly accurate ultra-microbalance is therefore the only solution to meet both today's and future needs. Material: Some filter materials are soft and difficult to handle. Users must take care not to touch the surface or damage the filter (which can happen all too easily). Humidity: One of the biggest challenges when weighing filters is that they are highly sensitive to humidity in the environment. Their hygroscopic behavior makes them appear heavier, affecting the accuracy of results. In addition, PM deposits can also retain water affecting the overall result. if not addressed, can attract additional particles and lead to skewed results. These electrostatic charges can also set up fields of attraction/repulsion in the surroundings, influencing the weighing result. Buoyancy: Filters have a low density which makes them susceptible to air buoyancy and they appear to be lighter than they actually are. Air buoyancy influence differs with changing temperature, air pressure and humidity. By weighing the filters in the same environment (e.g. cleanroom) before and after PM loading, the buoyancy effect could be considered to be equal in both cases. However, to reduce uncertainty the true weight must be obtained by compensating for the air buoyancy influence. To add further process complexity, the filters must be tracked precisely. Each filter is pre-weighed, placed in a labelled holder, acclimatized, and then transported to the test site. After PM loading, filters are transported back to the lab and reweighed. Accuracy is put at risk if there is not a failsafe system in place to ensure filters are not mixed up during processing. With several guidelines specifying the weighing system to be used, it is crucial that the balance used meets the needs of the filter weighing application. For such small samples, the minimum net sample weight of the balance is of critical importance – weighing a sample below this weight cannot be trusted to be of the required level of accuracy. Filter weighing for emissions testing can take a long time to complete. Acclimatization processes, transport to and from the test site, laborious handling procedures and a balance which is slow to settle contribute to a typical car exhaust emissions test taking up to 2 days or longer to finalize. Determining the weight of particulate matter is a key task in emission testing for environment control and automotive industry. The weighing results need to be very accurate but the process itself faces a number of challenges, like influence of electrostatic charges or temperature on filters. Therefore, do not hesitate to ask for an advice! Our Expert Team is there to help you, whether you are looking to purchase a balance or need support with filter weighing/emissions testing application. Contact us and receive assistance you require. 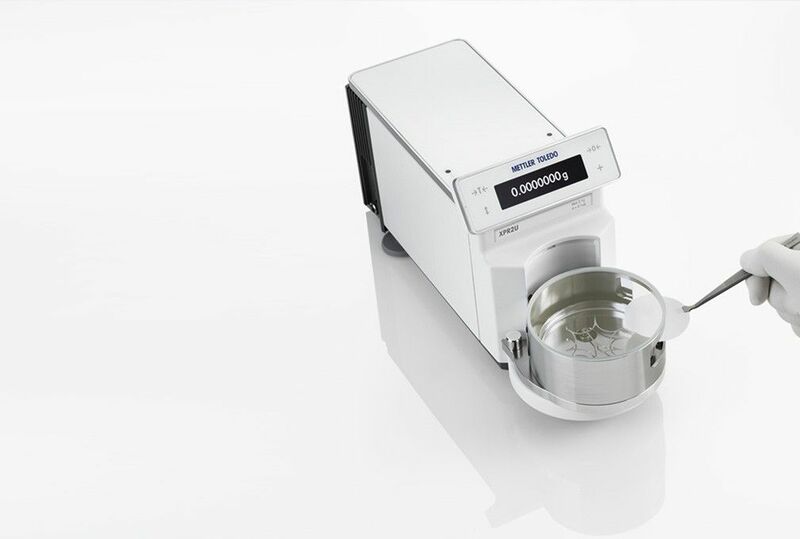 METTLER TOLEDO XPR microbalances offer unique precision and exceptionally low minimum weights. Outfitted with a special filter weighing kit and with 0.2 µg readability, the XPR2U is ideal for filter weighing and has the additional benefit of built-in active quality assurance functions to ensure weighing results meet defined tolerances and standards. Built-in user guidance ensures the differential weighing process is followed precisely. The addition of a barcode reader offers quick sample identification and the convenience to automatically match loaded filters with pre-weighed results for faster processing and fewer handling errors. Plus, passing the filters over the electrode of an AntiStatic Kit neutralizes any electrostatic charges present and ensures the true PM result is measured. Thanks to multiple connectivity options, weighing results can be exported directly to a spreadsheet on a PC or to a company database system for inspection and further analysis. METTLER TOLEDO tweezers are specially designed to ensure correct handling of the delicate filters as they are transferred to and from the storage cartridge and the filter weighing kit on the balance. Weight of particulate matter collected on filters for Emissions Testing can be extremely low, therefore the weighing procedure has to be performed very accurately. 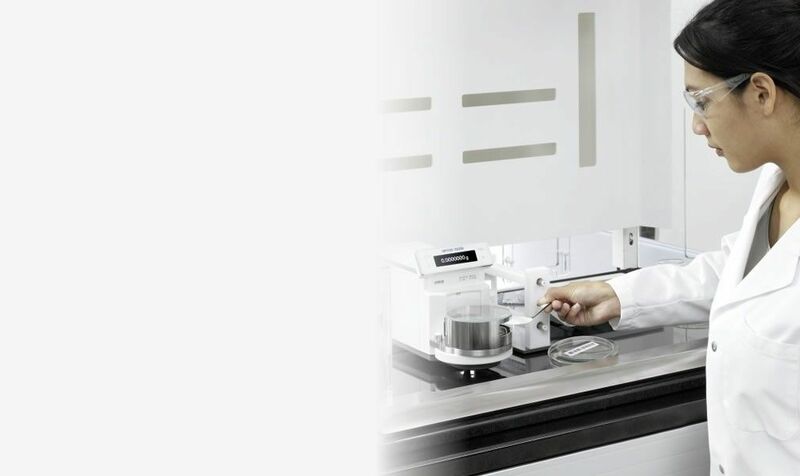 See why METTLER TOLEDO Excellence Micro-balance, equipped with especially developed accessories for filter weighing, is the best choice for Emissions Testing application. Weight of particulate matter collected on filters for emissions testing can be extremely low, therefore the weighing procedure has to be performed very accurately. Excellence Level microbalances with a dedicated filter weighing kit are perfect for emissions testing. The outstanding repeatability and lowest possible minimum weight provide the weighing performance you need. 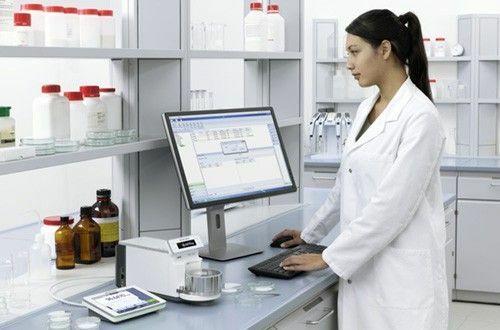 METTLER TOLEDO XPR microbalances are fully compatible with LabX laboratory software. LabX provides full SOP user guidance on the balance. It recognizes the loading and unloading of filters, simplifying and speeding-up the process. LabX automatically records the weight values against the correct sample IDs and performs all calculations automatically, including correction for air buoyancy. All data and results are saved securely in a centralized database providing full traceability. Customized reports can be printed out or transferred to an internal information system. When more than 40 filters are weighed per day, the PWS-ONE Filter Robot, in combination with the XPR2U, is the perfect automated solution. The innovative filter holder allows identification, acclimatization, storage, transport and weighing all in one cartridge, without interruption or removal of the filter. It also acts as a Faraday Cage thereby reducing electrostatic influences. Automated sample changing allows effortless filter pre- and back-weighing and results are immediately transferred to a PC for analysis. What to Do If You Need to Weigh Large Filters? If you're using large filters, for example for analyzing industrial filtrations, METTLER TOLEDO has handy and cost-effective solutions for weighing larger filters on your analytical balance. With the addition of a filter weighing kit, filters up to 110 mm can be conveniently weighed on a METTLER TOLEDO Excellence analytical balance. To weigh filters up to 150 mm, the use of a dedicated ErgoClip is recommended. Both solutions can be quickly and easily installed on your existing balance. Forget electrostatic issues! My XPE analytical balance warns of static charge. The integrated anti-static kit discharges efficiently. METTLER TOLEDO's innovative PFS-ONE Filter Robot guarantees the fast and precise determination of particulate matter at an accuracy of up to 0.1 µg. METTLER TOLEDO’s filter kits and antistatic solutions enable you to convert your balance into a dedicated filter weighing solution.